There's a saying amongst the officers: "If a job's worth doing, it's worth doing well. If it's not worth doing, give it to Rimmer." He aches for responsibility but constantly fails the engineering exam. Astoundingly zealous, possibly mad, probably has more teeth than brain cells. Promotion prospects - comical. His mother seems to have spent a great deal of time with more successful officers in positions that would baffle most balloon-modellers, (Note: Contact Rimmer's mother, mention you're a captain) and Rimmer divorced his parents at the age of 14, only retaining access to the family dog every fourth weekend. The at best ambivalence, and at worst outright hostility, shown towards Arnold by Rimmer Sr. is perhaps explained by the fact that his true father was, in fact, the family's gardener, Dungo (Note: The birth certificate in Rimmer's personnel file suggests Dungo's real name was Dennis. A fine name.) Rimmer was blissfully unaware of this, however, until some three million years or so after his father's death. 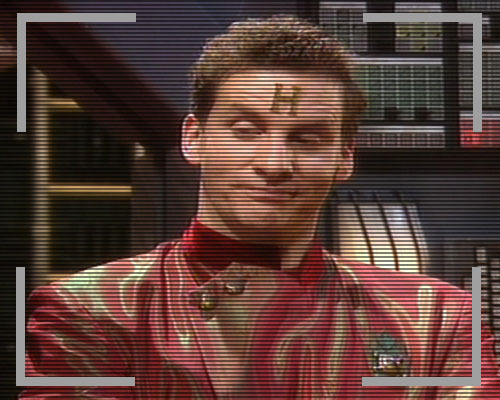 For a time, Rimmer studied at Io Polytechnic, but reports from his tutors were less than glowing - with one lecturer declaring him to be the most idiotic, lame-brained student he'd ever come across. He eventually transferred to Saturn Tech, where against expectations he passed his maintenance course, electing to enrol in the Space Corps and work his way up the ranks. Despite this failing, Rimmer continued to lie to his mother. While his father suffered a series of strokes (Note: Accusations that this was caused by Rimmer's perpetual failure are unfounded), he told her that he had reached the position of 'Rear Admiral Lieutenant General.' In reality he was still making sure the vending machines didn't run out of fun-size crunchy bars. Following the nanobotic revival of the Red Dwarf crew, a new, living Rimmer emerged. Lacking the five years of growth the previous version had experienced, he promptly attempted to cheat his way up the ziggurat of command and condemned himself and his companions to two years in the ship's brig. (Note: Possibly the best place for them.) He was last seen, erm, dying. Maybe. Having recently learned the truth about his parentage, Rimmer was strangely emboldened, and made a bold and uncharacteristically heroic decision that again saved the lives of his crewmates. Time will tell whether or not this will herald a permanent change in his personality, or if he'll go back to being a snivelling, weaselly toad (Note: I'll give you $£10 on the latter).